Sittankanay Glacier drains the north side of the small icefield that feeds the retreating Wright, Speel and West Speel Glacier. The 10 km long glacier is the headwaters of the Sittkanay River, a tributary to the Taku River. 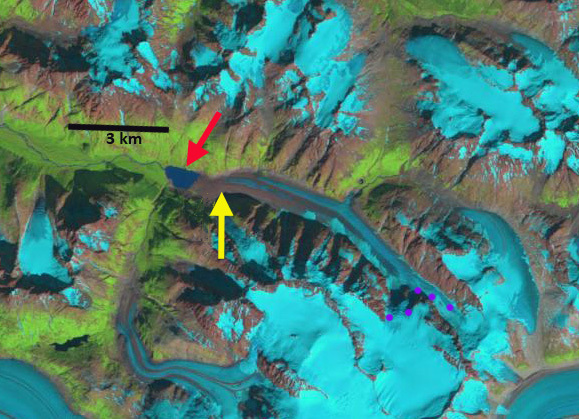 Here we utilize Landsat images from 1984-2013 to identify the recent changes in the glacier. The glacier begins at 2000 m and ends in a lake at 250 m, the terminus has heavy debris cover, which is unusual for this area. 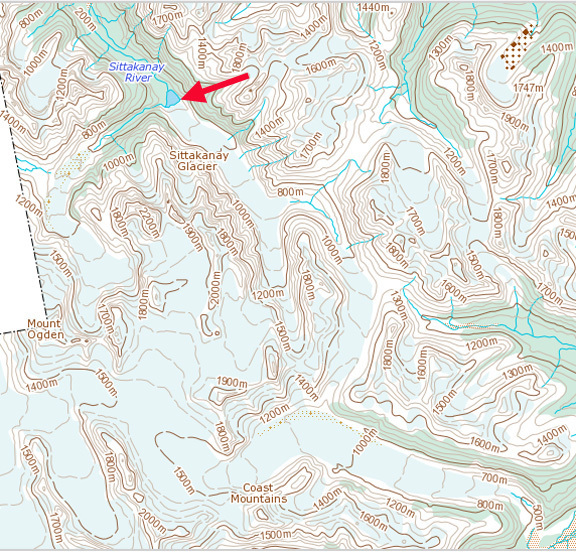 The Canadian Topographic map indicates a lake that is 400 m long. 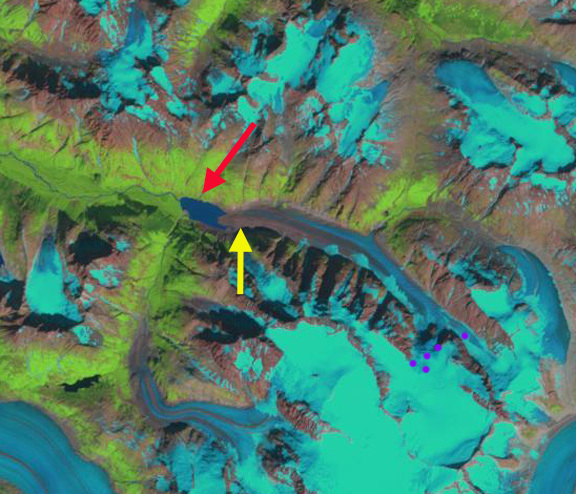 In 1984 the terminus of the glacier, red arrow is at the base of a steep gulch, yellow arrow marks the 2013 terminus. The lake has expanded to 600 m in length. 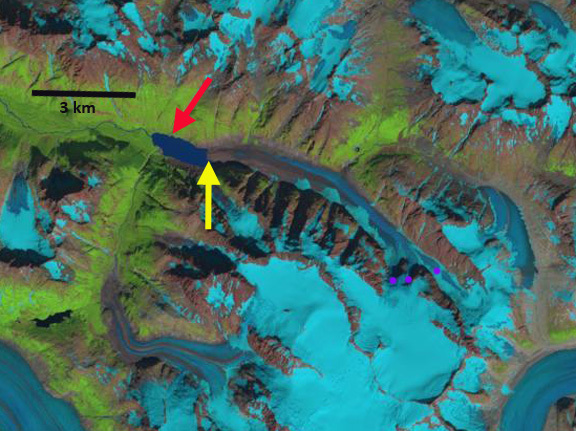 The purple dots indicate the snowline is at 1500 m, which leaves limited snowpack for sustaining the glacier. In 1996 and 1999 the snowline was also at 1500 m, indicating negative mass balances that underlie the retreat. By 2013 the glacier the lake had expanded to 1700 m in length. 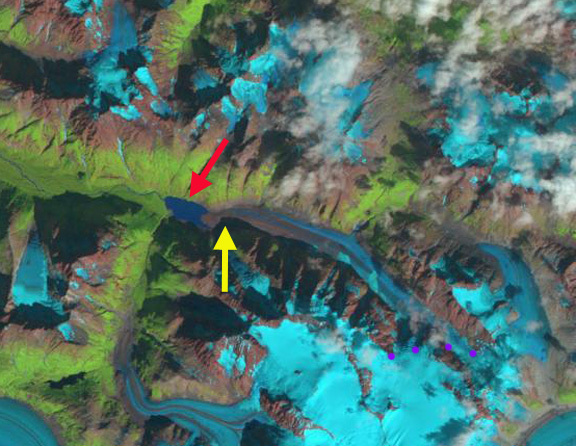 The glacier has retreated 1100 m since 1984. The snowline is at 1400 m in the mid-August image, and will rise above 1500 m by the end of the melt season. 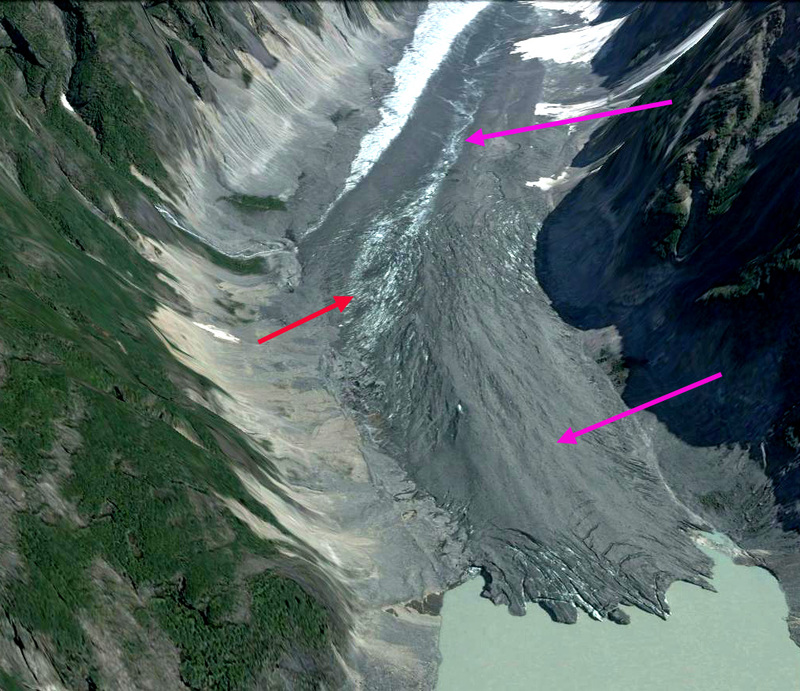 A close up view of the terminus indicates the heavy debris cover has large uncrevassed sections that appear nearly stagnant, pink arrows. 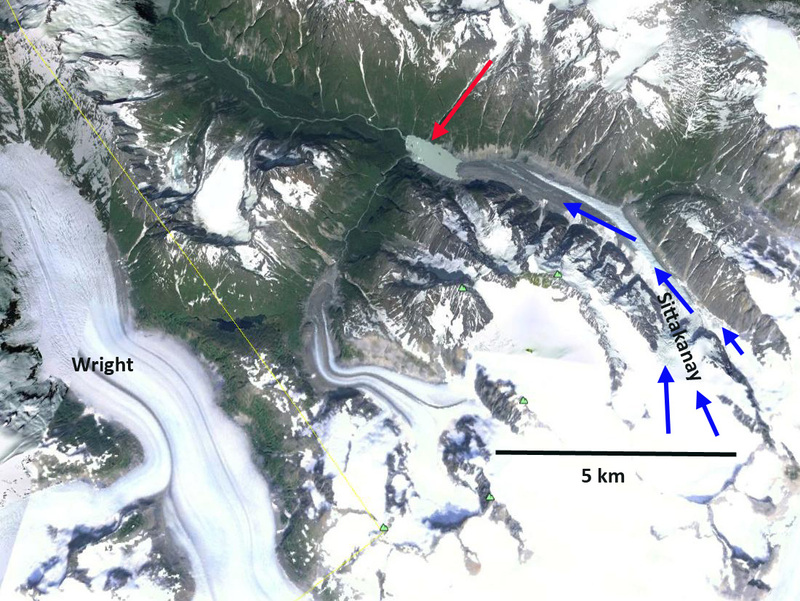 There is one feature in the 2006 Google Earth image that is 1.0 km from the terminus, a circular depression-red arrow, with concentric crevasses that indicates a subglacial lake that partially buoys the glacier. This also indicates that rapid retreat will continue. The retreat is enhanced by calving, but it is the insufficient size of the accumulation zone that is driving the retreat of this glacier and its neighbors. This entry was posted in Glacier Observations and tagged british columbia glacier melt climate change, British Columbia glacier retreat, glacier climate change, sittakanay glacier melt, sittakanay glacier retreat, sittankanay river runoff. Bookmark the permalink.